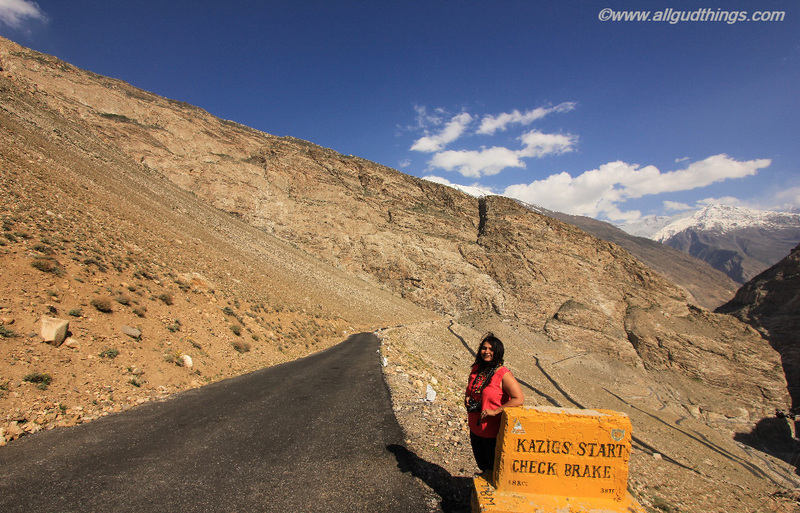 As we were heading to Spiti Valley from Kinnaur, the road was curling and getting narrower through the wide valleys, the wind was flowing through the mountains, and I looked out through the window of my car in astonishment that how the lush green mountains were taken over by arid huge mountains. There were no people and vehicles around, only we, the nature and sky in its quintessence form. So, ideally, we should say it was a “Drive to No Land”. Finally, we saw the colorful Buddhist flags fluttering over the peak and a small village popped out nestled among the barren Himalayas. It was none other than the Heritage Nako Village which is well known for its Nako Lake and centuries old Nako Monastery. The ideal time to visit Nako Village: April – October. Avoid traveling during winters as there is heavy snowfall and roads get closed. The word Nako comes from the Tibetan word “Nego” which means Door to Holy place. 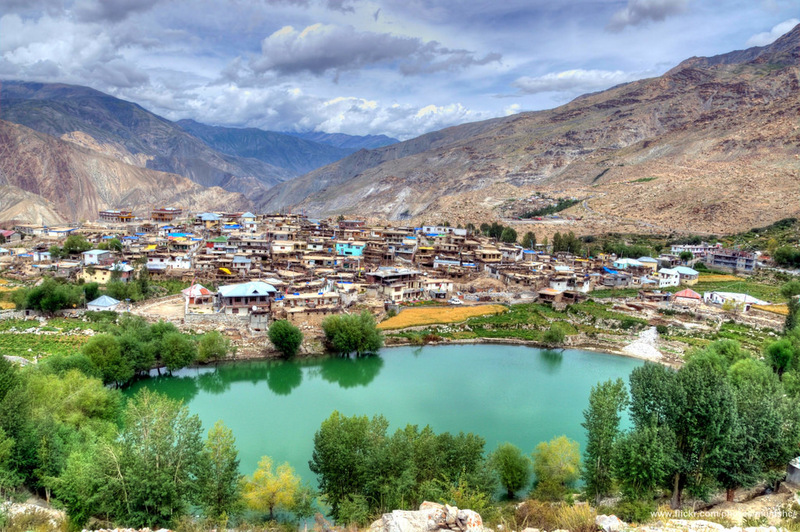 The small picturesque green Nako Village located in Kinnaur district is perched on the banks of Nako Lake at 11,893 feet. It lies in the Hangrang Valley and has an extraordinary backdrop of majestic Reo Purgyal (22,632 feet), which is the highest mountain of Himachal Pradesh. The Nako Village is a part of restricted zone along the Tibet border. Foreign tourist needs to take an Inner Line permit from DC office at Shimla, Kullu, Manali, Rekong Peo or Kaza for visiting and staying in this village and it is valid for two weeks. The Nako Village is a glory with maze cobbled lanes and further by lanes. The traditional houses are made of stone and mud which remain warm in winters and cool in summers. Summers are just for the say; as the maximum temperature in peak summers here goes to 20 degree Celsius. The doors are made of stone and wood and are painted from inside with the Buddhist inscriptions. Gradually; the concrete and more modern houses too have come up with the trolling tourism. Solar panels are installed at many places in the village to reduce carbon emissions from firewood. 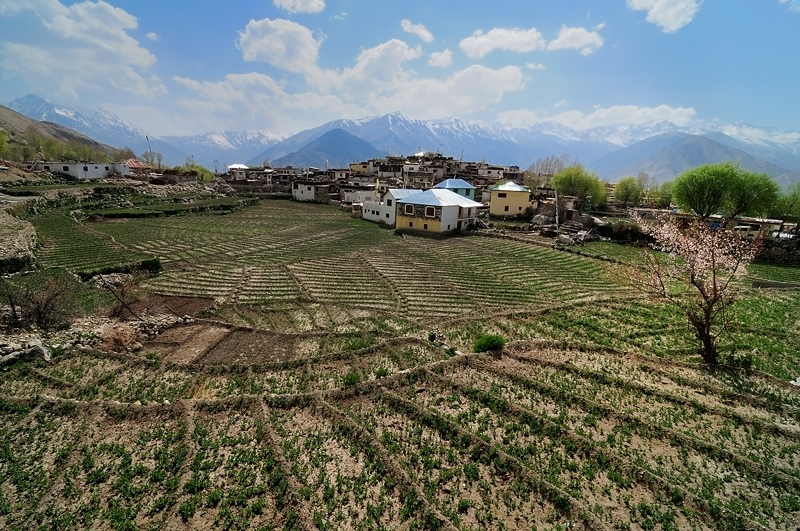 Villagers and their chief strongly believe in making the place environment-friendly, as they clearly understand that Nako village lies in seismic zone 5 and too much environmental disturbance can lead to severe disaster. The Prayer wheels, flags and Mani stone mounds are seen around for the peace and prosperity of the village. The villagers have Tibetan features and burnt complexion, as they love soaking themselves in the direct sun during days and fire at night. The greenish blue lake, vast azure sky and the open expanses around the village make it a tourist as well as photographers paradise. The Nako Lake is just like an oasis in between the naked mountains. It is oval shaped, seasonal Lake with a small walkway along. The thick canopy of Willow and Poplar trees surrounds the Lake periphery from all sides giving it a bluish green color. The Lake is sacred, as Saint Padmasambhava is believed to have meditated here. 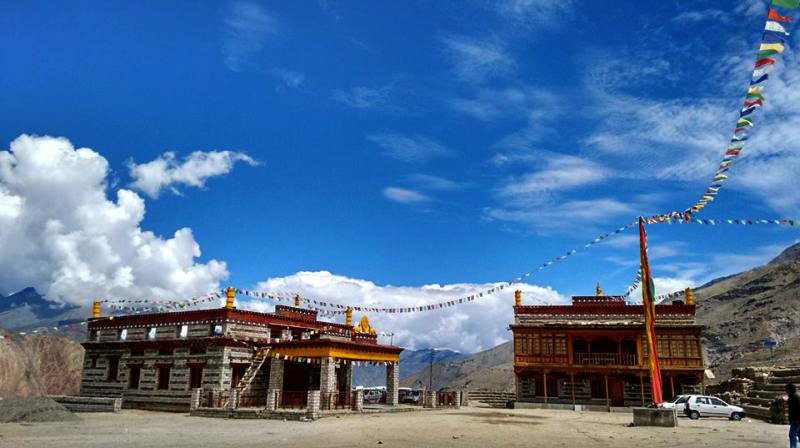 Just close to the Nako Lake lies Padmasambhava temple; which holds his idol and foot prints on the stone dating back to 8th century. Rinchen Zangpo also known as Ratna Bhadra; translated all the Buddhist scriptures from Sanskrit to Tibetan and established 108 monasteries in this region in the 11th century. Nako Monastery is one of those monasteries. Monastery has bright artwork, centuries old sculptures, idols, and murals in it. During 1975 earthquake, the roofs and artwork of monastery were vandalized. Further, due to extreme winters in 1998, the monastery was at the urge of collapse. In 2002, Nako Preservation Project was launched to restore the Nako monastery and other affected buildings and today this monastery stands well in a restored condition. (Note: Photography is strictly prohibited in the monastery). The Chango Gompa lies on the Spiti road at Chango. 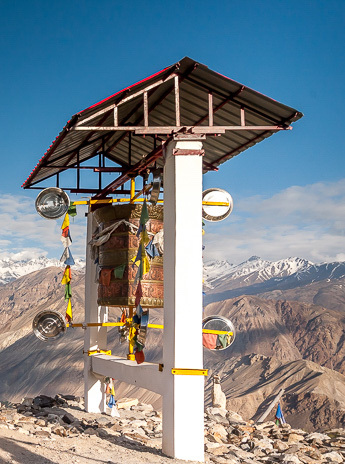 It has 500 years old prayer wheel which is 3.5 meters in diameter. The Chango village is famous for apricots and apples. 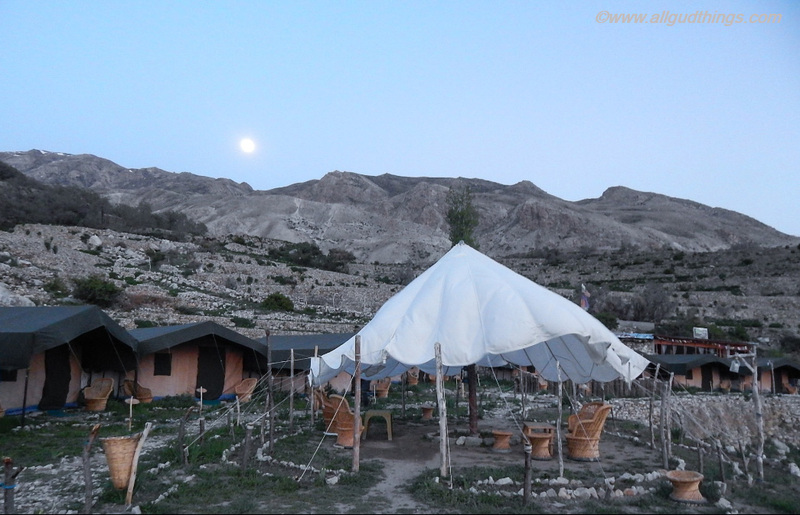 The budgeted home stays, hotel Reo Purgil and Knaygoh Kinner Camp are the only options for accommodation at Nako Village. The price for Homestay starts from Rs. 200 and goes up to Rs. 650/- whereas in the hotel and camps it goes up to Rs.4000/-. We stayed at Knaygoh Kinner camps and it was worth every penny. The camps offer a panoramic splendid view of Nako Village and snow capped; arid Himalayas. The locals run small Dhabas and serve momos, chowmein, maggi, soup, Rajma rice and Parantha as a menu. At Reo Purgil and Knaygoh Kinner camps, one can get to taste the local, Indian as well as continental cuisines. Roads are perfectly built but narrow. So, prefer driving up and down only during day times. Moreover, nothing beats the day views of this valley and we are sure you cannot afford to miss them. Nako Village lies in a rain shadow region. Always there is an overcast of clouds but rains happen unlikely. The rain usually happens in the form of snow here. In the evenings and mornings temperature dip variably in summers too, so always carry sufficient woolens along. Always walk clock wise around Buddhist temples and shortens, keeping your right side facing them. Don’t touch stone mounds and prayer flags with the left hand. The Youth social club puts real efforts to keep the village clean and eco-friendly. They have installed dustbins throughout the village. So, use them to throw the waste. Avoid using poly bags. The members of youth club encourage villagers to use cloth bags instead of poly bags and they have distributed them too. Wood is the most expensive thing in Nako. You may have to pay additionally for the bonfire. Avoid playing loud music especially at night. Before leaving for a road trip, get your vehicle properly inspected and keep it equipped with the required accessories. 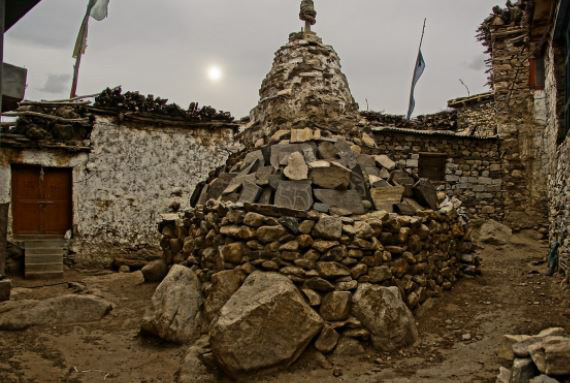 Do spend a night at Nako, to experience the heritage, spirituality, and tranquillity of nature. There are never ending mountainscapes, which leaves you wondering every way. We left Nako Village with a broad smile, thinking to return back soon. What do you think about this heaven? The Nako village looks fascinating, rustic, and beautiful. Thank you for showing me this unique place. I love your photographs! 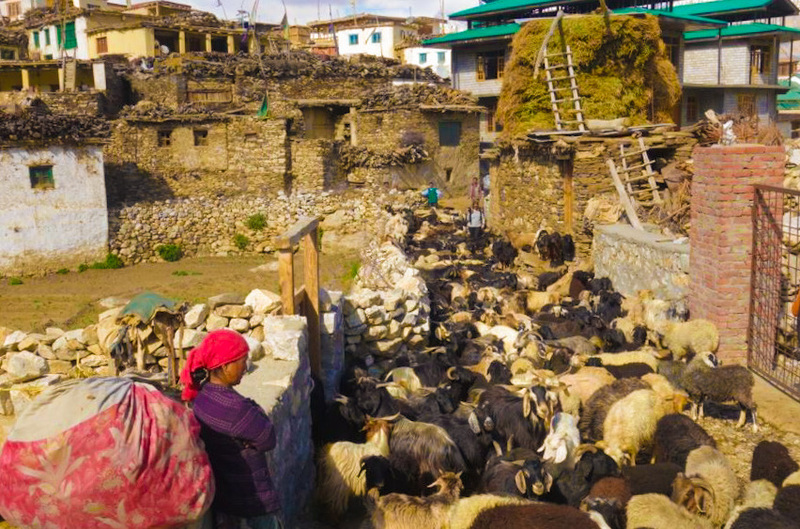 I don’t know that I’m finding the Nako village itself very picturesque (your photos are great and give a really good insight into how it looks), but I am certainly fascinated by it, and by the lives of those who live there, in such a remote location. The landscape looks harsh but beautiful, must be a hard place to live. Kinnaur is one of the few regions that is still so pristine and lovely. This is a great guide.. Thank you! Sounds like a wonderful adventure! The town looks adorable and the views in the surrounding area look fantastic. I would love to check out Nako Lake–the color is so bright and vivid against the rest of the landscape! Thanks Neha, that is such a lovely title. Always welcome dear. Do let us know when ever you need any help. I had not even heard of Nako until I stumbled upon this blog. 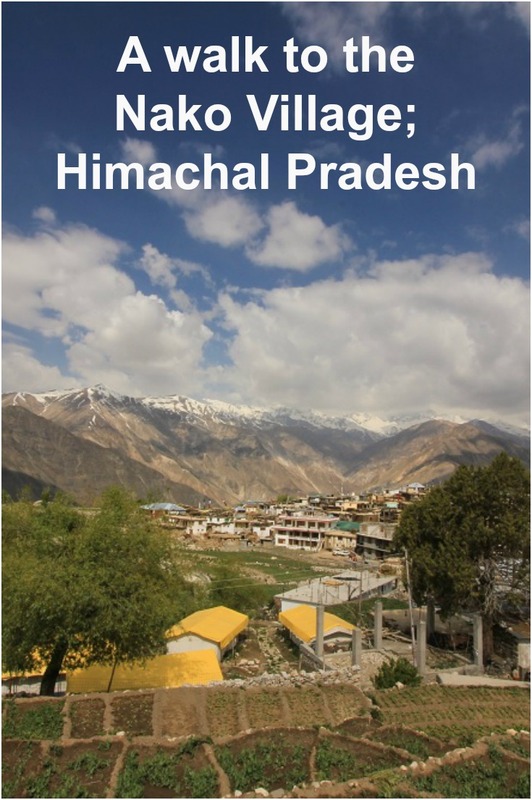 The villages of Himachal are so pristine and many of them are still waiting to be discovered. It is heartening to know that more and more villages are using solar panels. That’s a positive step towards sustainable development. Wow this visit sounds like a really incredible experience – what an amazing opportunity to spend time in nature and in an authentic village – the traditional housing is fascinating, and it’s so great to hear that they are utilizing solar power and prioritizing environment friendly initiatives. The lake looks stunning, and you’re right, the backdrop of Reo Purgyal truly is majestic. I think I just extended my bucketlist! It seems like you just got a great adventure! The town looks so beautiful and the surrounding area is awesome. I haven’t been there but definitely love to get there one day real soon. Nako looks so pristine and serene. No doubt it is getting so much attention these days because I remember reading about it at least on two other blogs recently. I m actually happy for you because you got to experience this beauty before it becomes another tourist destination. I hope to explore the beauty of Spiti soon. Lovely photos btw! This is the first time for me to hear about Nako Village and I love how rustic it is. The Nako lake looks so beautiful with the mountains in the backdrop. Thank you for sharing your beautiful photos and experience! wow. I enjoyed this post. I felt like I have walked in the village myself. It must be truly an amazing experience! What a fascinating area of the world! I love how eco-friendly it is. Solar panels – so awesome! I love these kind of small picturesque villages that dot the countryside of India. The Nako village appears so picturesque and untouched, hope it remains that way and retains its pristine character. The pictures of the place and the environs are stunning. These photos are awesome. Great post. 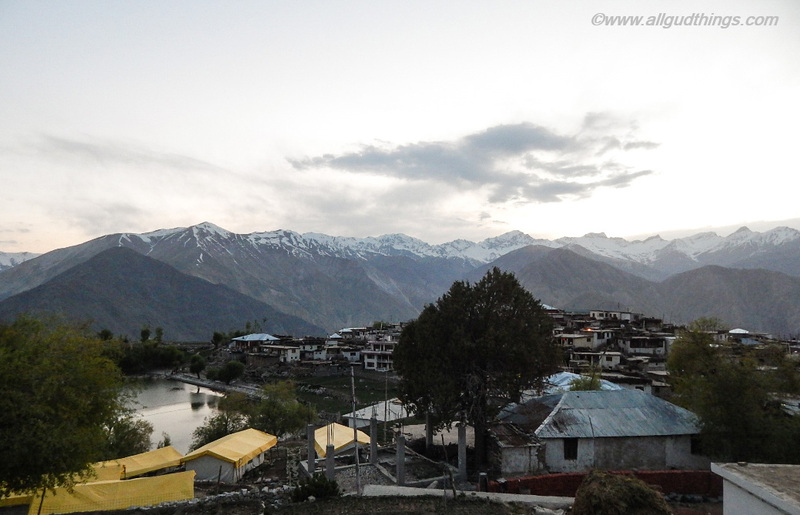 I was in Nako in 2012 and was quite happy to discover an article on this village Your photos and article make me want to go back to Kinnaur one day. It was a fantastic and intense trip I will never forget. After reading your post, I realized that I haven’t experience to herd cattle or goats! I wish to do that as part of experiential tourism. That shot of Nako lake is brilliant. I could spend a good week at Nako Village after reading your post. bookmarking it for 2018. Cheers!! Oh wow, such a beautiful place. I have been to Himachal many times but never been to this village. These small places actually bring out the beauty of the place. Thank you so much for sharing. I will definitely visit this place when I will visit Himachal next time. Himachal is so much in my wishlist that I wrote about it recently! There is so much to see and discover in the backdrop of the mighty himalayas! I’d accept – with so much beauty, its indeed the door to holy place!!! I’m delighted to know about the use of Solar Panels! The Mani stone mounds are fascinating. Thinking of reading more about these. And the Nako Lake is so beautiful. Does it snow in this region? This Nako village is so beautiful and surreal. Loved the pano shot by the one borrowed from Outdoor Photographer. Its interesting that the locals are aware for responsible travel and solar panels. I think its more so because their livelihood is threatened, and the locals are usually more connected/synced up with nature than people who visit Nako for travelling/touring.